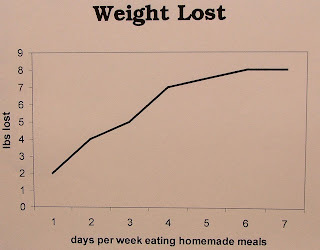 My guess is that if you graphed the relationship between eating nutritious homemade meals and weight loss the resulting chart would be quite encouraging. It’s the type of visual that inspires us to take action. In this case the action required is cooking which in my mind is a much easier route to losing weight compared to working out three times a week at the gym. However my bet is at some point the benefits of eating right are going to plateau and eventually you will have to do some physical exercise to shed the remaining unwanted pounds. But don’t worry about that now. Enjoy your delicious calorie conscious homemade meals and their resulting benefits as you travel to the plateau. Tackle the next step when you get there.